There is a war in my house, one I seem to lose day after day; I’m talking of course, about the battle to find the perfect temperature. Either the thermostat is too low and I find myself huddled under the blankets at 3 a.m., too tired to get up and raise the temperature or the house is too warm when I get home from work. But this year, victory is mine because I’ve discovered the answer to this pesky problem: Wi-Fi thermostats. These easy to install devices let you control the temperature from anywhere using your voice or an app, leaving you comfy and cool year-round. Check out our Guide to the best Wi-Fi Thermostats, complete with buying tips and in-depth reviews to find the right device for you! 2 5 Top Rated Wi-Fi Thermostats – Which one is the Best? We will review 5 of the best devices around, and while all have features worth considering, our overall top pick is the Nest Learning Thermostat 3rd Gen. Thanks to its innovative features, reasonable pricing, and easy usage it edges out the others on this list. However, the other devices also have a lot to offer, and some may or may not work with your existing system, so check out all 5 reviews before you buy. 5 Top Rated Wi-Fi Thermostats – Which one is the Best? 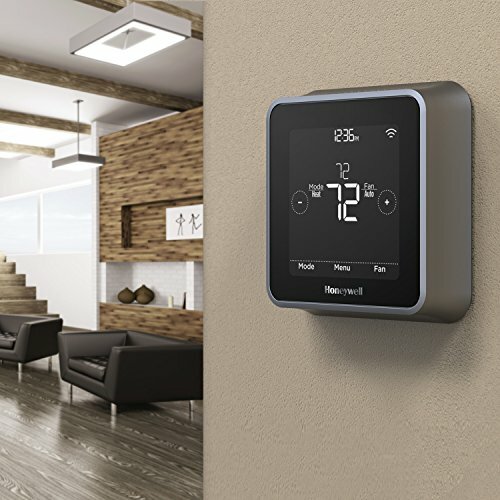 Now that you have a clear understanding of what these devices can do, it’s time to look at the best of the best Wi-Fi thermostats. Each review will highlight the best features as well as explain any shortcomings to help you make the best choice. Energy Saving: The Learning Thermostat uses a little leaf to let you know when you have it at a temperature that saves money; it also lets you know through the app what your energy history is, so you can see when and how you use your system and make changes where necessary. 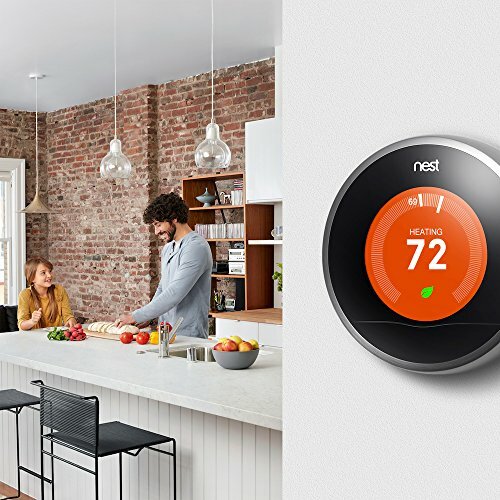 Auto-Schedule: Thanks to an intuitive design, you no longer need to set a heat or cooling schedule; the Nest will learn your patterns and program itself. That means you won’t waste energy when you’re out, and you’ll stay comfortable when you’re home- without having to lift a finger. Easy -to- Use: Connect the Nest to Wi-Fi, and you can control it using your phone, laptop, tablet; it’s also compatible with Amazon’s Alexa for hands-free operation. The one drawback to the Nest is that installation can be complicated if you’re a novice; they do offer installation, but it will cost you more so you need to factor that in if you don’t know how to do it yourself. Simple Installation: The Sensei app walks you through the installation process in a way that is easy to understand and works with most existing system wires, so even beginners can do it without a problem. The instructions are clear and concise, so there is no confusion or mistakes, allowing you to hook it up in under 30 minutes. Compatibility: Speaking of systems, the Sensei is compatible with most heating and cooling systems without needing a common wire. It runs on double A batteries and can work with up to 4 stages off heating and 2 levels of cooling; works with existing gas, oil, geothermal, radiant heat and heat, pump systems. Geofencing/Flex Scheduling: Heat your home where, when and how you want. Geofencing uses your smartphone location to control heating and cooling in areas you don’t occupy while the 7-day flex scheduling allows you to set the temperature for the week exactly how you need it. The one negative with this thermostat is that it runs through Emerson’s cloud servers, which can be unreliable at times; as such, sometimes the thermostat will read as being offline, and you may not be able to adjust the temperature for a short period. Spot Control: The Ecobee3 Lite can be paired with room sensors to eliminate hot or cold spots anywhere in the house; not only does this keep you comfortable year-round, but it also saves you money and can help you discover and fix existing problems. Remote Access: Using the easy-to-follow app you can adjust the temperature from your couch, work, or the airport. No matter where you are you can communicate with the Ecobee3 and raise or lower it. 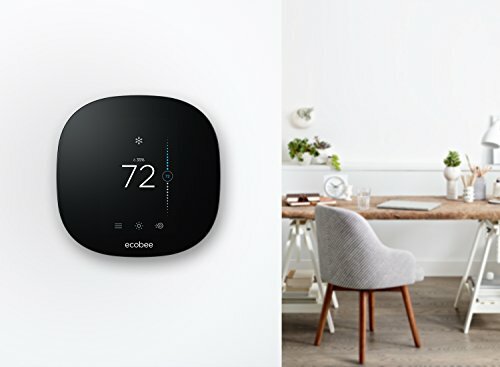 Seamless Integration: The Ecobee3 works with Android, Samsung SmartThings, Wink, IFTTT, and is Apple HomeKit enabled, making it the ideal device for most smart homes as it fits in seamlessly; no hours of programming or connecting necessary. For many, this device ranked high, with the only complaint being customer service is lacking. Many experienced long wait times and less-than-friendly reps; this can be a turn-off, but in reality, you shouldn’t need customer service all that often. Adaptive Temperature Control: The Lyric T5 will learn what temperatures you want you home at and when then run your unit to get to that number in the shortest amount of time; it will also change from cooling to heating when necessary without you having to program it. Multi-Level Control: Use the touch screen, app, or voice control with Amazon’s Alexa or Apple’s Siri to change the temperature instantly; which means you never have to leave your warm, comfy bed to raise or lower the AC or heat. Easy, Exclusive Installation Kit: The Honeywell wall plate makes connecting to your existing heating or cooling units a breeze. The set-up is easy to understand, and most can do it without using a professional. Buyers of this product have one major complaint: the app can be a bit unresponsive, which can be frustrating. However, since you can control it from the screen or your voice, so you may decide to overlook this minor issue. Custom Display: The colored touch screen is not only easy to use, but it can also be easy on the eyes as the background color can be changed to match your home’s decor. For those with an eye for details, this is a nice perk. 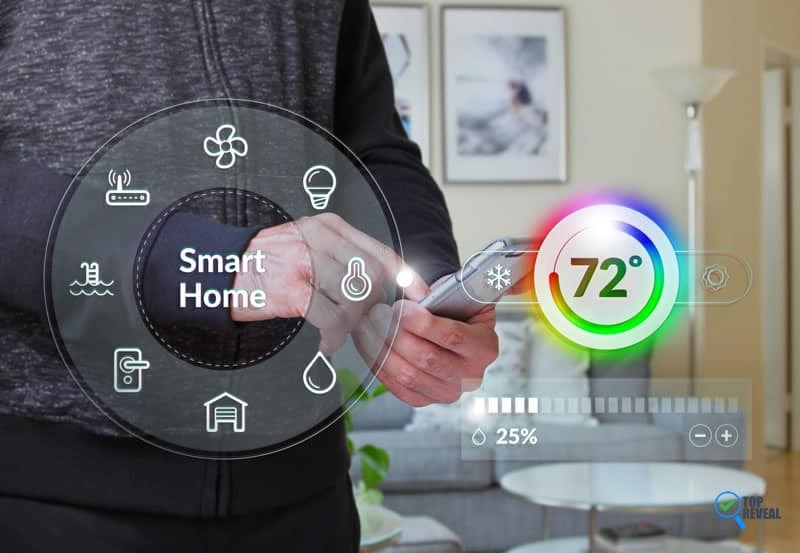 Smart Response: This device learns your heating and cooling patterns, then automatically goes to that temperature; it knows how to get the temperature you want in the least amount of time, saving money and energy for more efficient heating and cooling. Precise Scheduling: With the RTH9580EF, you input whether you are using the thermostat in a home or business and it will give you options specific to that area. For instance, if it is in your business you can have it run only when it’s occupied or on select days, for a more streamlined operation. The one negative with using this thermostat is that it is not compatible with heating systems that use electric baseboards; if you have that style of system, this is not the thermostat for you. Of all the smart devices I’ve invested in, my Wi-Fi thermostat is by far my favorite; and it will be yours too once you see all it can do. These thermostats are the ultimate in convenience, allowing you to control the temperature in your home using the device itself, voice command or a smartphone app. Using a Wi-Fi connection, you can communicate with your thermostat and keep your home or office the perfect temp. Most are compatible with smart hubs like the Amazon Echo or Samsung SmartThings, and some let you adjust the temperature in individual rooms, eliminating damp spots and helping you discover and fix any drafts. Plus, many allow you to set up timers and schedules, helping you to keep your house at the right temperature and save you money. Feeling a little chilly? Just tell Alexa to turn the heat up, and you’ll be toasty in no time. Want your house to be nice and cool after you pick the in-laws up from the airport? Just use your phone to turn the temperature down 30 minutes before you get there. The ability to change the temperature from home, work, or halfway across the world is a convenience worth any price; lucky for you, these devices won’t break the bank. Installation: The first thing to consider is how easy or hard the installation is. For instance, can the device be installed by you or do you need a professional? Can you use your existing wiring? Is there more than one way to configure it? These questions are paramount to figuring out which device to buy, as the degree of difficulty should match your abilities. Hiring an electrician can cost money, but if you’re not handy and the install looks complicated, you may not want to risk ruining the device or causing a short. Compatibility: Many Wi-Fi thermostats are compatible with most heating/cooling systems, but make sure your thermostat works with what you already have and how it is set up. Some people have separate thermostats for upstairs and downstairs, which may require you to buy 2 devices or need to rewire your existing system, so understand what you have and what you’ll need. Smart Pairings: Most of these thermostats work with other smart devices and hubs, so check to see what smart brands your thermostat pairs with. You don’t want to buy an Android-based device if everything else you own runs through Apple or get a model that doesn’t work with Alexa if that’s what you’re currently using. Usage: Are you looking for general temperature control or do you need spot heating and cooling? How you plan to use the thermostat will determine the model you pick. For example, if your kid’s room is always chilly, you may want a device with sensors to maintain a warmer temperature in that area only. I hope our guide to the Best Wi-Fi Thermostats has helped you understand why owning one of these devices is such a good idea. While the Sensei is our top pick and is a great value, the other 4 models are equally impressive and work well in any home. 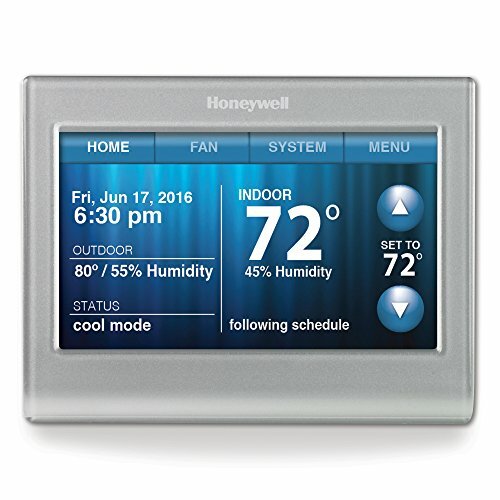 These thermostats are efficient and convenient, keeping you cool in the summer and toasty in the winter- all without having to get out of bed, or even be home! Whichever you choose, you can rest easy knowing you have bought a quality device that will make your life easier.